BBC News - Is Japan's economy a warning for China? Is Japan's economy a warning for China? Japan's workers have an air of purpose about them, even if their economy is no longer the rising giant it once was. In the morning rush hour, streams of dark suited salarymen hurry from the exits of Shinagawa station and along the walkways above the streets to the big office buildings around. In central Tokyo at least, it does not look like a country that's been stagnating for two decades. 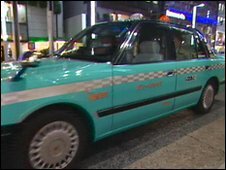 But sitting in the taxi rank waiting for a fare is one man whose life tells the story of Japan's economy. Fifty-seven-year-old Taro Suzuki is a big, bluff man with close-cropped grey hair. His green cab is clean and shiny. Mr Suzuki polishes it before the start of his 24-hour long shift behind the wheel. 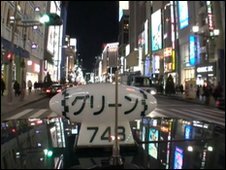 There are a lot of taxis in Tokyo and these days competition for fares is fierce. 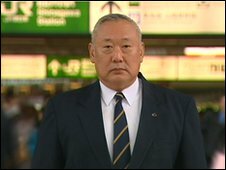 Once a salaryman in a big corporation, Mr Suzuki turned property speculator during the madness of Japan's 1980s bubble. Since then, things have not gone so well. "I made mistakes," he says. "Maybe it's not fair to say it because some drivers want to do this job and work hard for it." "But when I look back at my own life I don't think I have been successful. "It's the same with the Japanese economy. We never thought we would be at the stage we are at now." Back in the 1980s, it was Japan that was being tipped to one day even overtake the US, just like China is today. The economy was growing at a breakneck pace. On the last day of that decade the Nikkei 225 stock average closed at an all-time high of 38,916. Banks were lending freely and property prices rose so high it was said that the Imperial Palace in central Tokyo was worth more than all the real estate in California. A 10,000 yen note folded as tightly as possible and dropped in the city centre was worth less than the land it covered. Lots of people piled in hoping to get rich, including Mr Suzuki. The Japanese went on a spending spree for trophies around the world including the Rockefeller Center in New York. The bubble burst so dramatically that the 1990s were called the Lost Decade. The last decade was little better. Twenty years on, stocks are still down by nearly three quarters, trading this morning at 10,737. People and companies were left crippled by the loans they had used to buy assets that collapsed in value. Japan's government stepped in, pouring huge sums into infrastructure, propping up the economy. There are bridges to nowhere, the coastline has been concreted as have the rivers. And the result is a massive national debt. "Debt in Japan has been going up and up and up," says Martin Schulz, senior economist at the Fujitsu Research Institute. "It's now two times annual income. This is an enormous number. It's very difficult to overcome and it's considered as a big mistake, even by the current government." So is China about to make the same mistakes? On the face of it there are real similarities between China now and Japan in the 1980s. High savings, an undervalued exchange rate and rapid export-led growth creating the world's biggest current account surplus. Today in Tokyo's fanciest shopping streets Chinese tourists arrive by the busload on spending sprees. And when a prize tuna was sold at auction earlier this month in the city's fish market for $175,000 dollars the buyers were a Japanese sushi restaurant and a Hong Kong-based entrepreneur. Flats in Beijing and Shanghai have soared in value. "China is probably one of the best students of what Japan has done, including its mistakes throughout the last decades," says Mr Schulz. "They are boosting their domestic economy and asset prices are going through the roof. So they will try to rule this in very early not to end up in Japan's current situation." The Japanese are still among the most prosperous people in the world. China's economy may be overtaking in terms of total size but its wealth is spread among 10 times more people. But for Mr Suzuki in his taxi there are reminders around every corner of how he used to live his life in the time when it was Japan that was rising, not China. Particularly when he goes looking for fares around Tokyo's nightspots where the wealthy go to play. "It's almost embarrassing to say now," he says, chuckling. "We'd go to Ginza and Roppongi and spend hundreds of thousands of yen drinking. We'd eat sushi, or French or Italian food. We'd do that two or three times a week, sometimes every day. "That's how we did business in those days." Who wins from China's export growth?